Seven Hills Golf Club in Hemet, Ca. 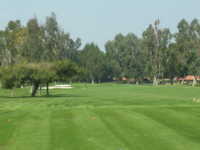 was voted "Favorite Golf Course" in the Inland Empire by Press Enterprise Readers Poll. Seven Hills offers terrific Hemet golf deals. The course resides on the outskirts of Riverside County about 5 miles from Diamond Valley Lake and 30 miles from the popular Lake Perris. This course winds through a nice retirement community. The Seven Hills Golf Club was designed by David A. Rainville and Harry Rainville, and was opened for business in 1970. This 18 hole course (par 72) measures 6,582 yards from the championship (blue) tees with a course rating of 70.8 with a slope of 117 on Bermuda grass. The course has a flat layout which makes it easy to walk. The greens are on the small side and are rated as pretty fast. The fairways are reasonable and well maintained. The course features reasonable hazards. If you are looking into Hemet tee times, you should check out the affordable Seven Hills Golf Club discounts. Reservations may be handled online or through the course starter. Amenities include a full service practice facility including 2 putting greens, a pro shop, cart rentals, wedding/banquet facilities and dining room. Players rate this course as a good value. The course is enjoyable to walk and watch out for those wicked fast greens.